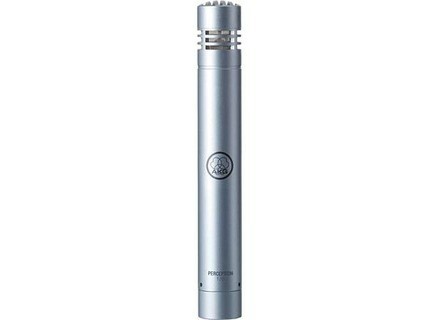 Perception 170, Small diaphragm condenser microphone from AKG in the Perception series. sw80's review"great for overhead mics"
The AKG Perception 170 Condenser microphone is sleek , stylish and more than affordable. It is a instrument microphone with a small diaphragm to give a clean and accurate sound. It does require phantom power and it has a cardioid polar pattern. I have been using this microphone for the last 3 years and it has always worked great with a number of different instruments tried out on it. At one point it was my first option to go with when someone would come to record an instrument track. This microphone does have a -20 db roll of switch and it is actually great for an overhead drum microphone. That is the reason that I am thinking of purchasing two more of these. The recordings you can get with the Perception are very clean and warmth. The makes the sound much better than I expected to get for a microphone that cost less than 100 dollars online. There is also a Perception 100 and 200 that came out around the same time and they are pretty good too. I have used them and the 170 before and the only difference is the price. Most AKG microphones are very well made and they are very durable. The best part about this microphone is the -20 db roll off because it is a must have for a condenser microphone that records instruments. My least favorite thing about this microphone is that with it being a capsule microphone getting it to sit right in some setups gave me a headache. Working in a tight space trying to get this microphone to fit and still face the right way gave issues with it being so long. But you will not have any complaints with the recording quality of it. I highly recommend it and look forward to buying a few more of these soon for overhead. I use it for the hihat or ride, and I tested for transplanting a guitar amp. Coupled with an Audix i5, very satisfying! Microwave static (transistor course) in need of phantom power. Cardioid. Mm in the registry, RODE NT5, Shure SM81. -20db pad in my opinion is crucial to this type of use and very effective. The microphone looks very sturdy for a static. Its almost aggressive in the upper medium but does not distort the sound. For less than 100 € new, and for his use, I find it very honestly. After one should not pass through a preamp to 1500 € to making singing, we agree! Yes, at this time RAS and satisfied. radioblagon's review (This content has been automatically translated from French)" good value"
used for 5 years, I have 2. They are relatively accurate, noise-free. Given the price, it is an excellent microphone for taking room in addition. I'm doing tests with binaural recording. - A gold-plated diaphragm (plastic, gold plating on one side) to DViT a short circuit on rear llectrode even for extremely high sound pressure levels levs. - Significant margin before saturation, minimum distortion: Able to reproduce without noticeable distortion of sound pressure levels of up to 155 dB and built to rsister tempratures lhumidit and leves. - Pr-attnuateur of switchable sensitivity: The switch-pr attnuation the back of the microphone allows daugmenter 20 dB margin before saturation proximity to a recording of undistorted. The pr attnuateur DViT of sensitivity allows the output level of the microphone noccasionne, especially low frequencies, an overload of transformers on miniature frquemment utiliss advantages of between mixers, etc..
Small important note: The packaging is trs summary, and I regret qu'AKG have not provided a small pouch for the microphone being protected (like Sennheiser, Shure or even). Prvoyez to buy one, or simply do as I do, keep the bote and moss, and store when not in use anymore. This is an unfortunate for transportation, if it is a microphone that is used in studio and / or concert. I pay by coupon Milonga in 70, but it was worth 100. Sure, it's a sum, but affordable compared to professional microphones, who rate much more expensive, empty. Finally, it is a good investment, given the possibility it offers, it will be useful both in studio and / or concert. I would put in a little while, a few samples of acoustic guitar recorded with this microphone. This microphone is intended recording acoustic guitars and percussion, is what made me choose. It is small electrostatic diaphragm. on the other hand Micka78 not agree with its cardioid pattern effectively allows him to what he has transplanted to the nose and a little bit on cts. The uni does that front, the omni-directional records everything around him a pice in situ. - The small switch of PAD recessed into the body of the microphone, so may be inconvenient to maneuver, but I do not use it, so am not sr.
Playback at 99 whereas normally it should be more expensive, and good stuff that price I jumped on it. Now I have enough micro, but if one of my two lche me and the price is also advantageous, it illico AKG.